A Sampling Bee: Falls River Soap Company GIVEAWAY! Unlike mass-produced commercial soaps, it takes some extra time and care for Falls River Soap Company to create a handmade soap. The soap artists work in small batches, using a unique, low temperature soap making method, using organic and high quality natural essential oils, herbs and botanicals sourced from all over the world. 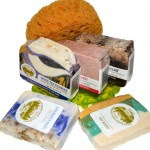 By aging the soaps to preserve the natural glycerin, Falls River Soap Company is able to produce the most luxurious, pure and gentle moisturizing soap imaginable. Thank you for taking the time to learn about Falls River Soap Company and their products. To show their appreciation, Falls River Soap Company is offering this awesome giveaway! Enter below for your chance to win a $50 Amazon Gift Certificate and an awesome Gift Basket from Falls River Soap Company!